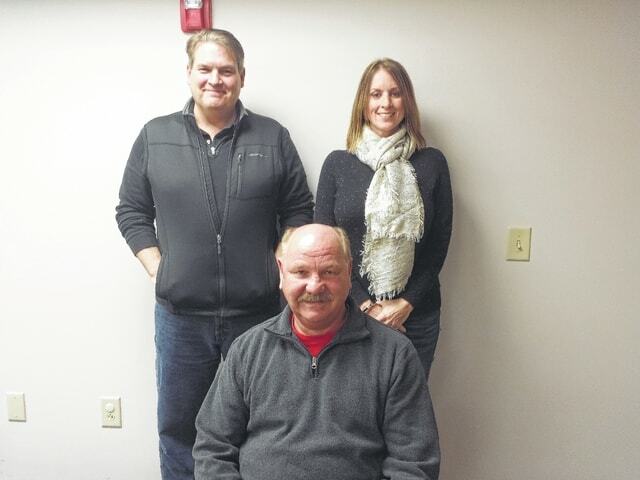 The Fayette County Park District met for its first official meeting on Wednesday and named Bob Pitakos (seated) as chairman, Angie Tackett (left) as vice-chairman and Dave Kiger as treasurer for the board. With more planning to do, the district board is urging the community to visit their Facebook page “Fayette County Park District” to help make recommendations and to bear with them as the process won’t happen overnight. The Fayette County Park District met for its first official meeting on Wednesday and named the chairman, vice chairman and treasurer of the board. The three-member board accomplished a few crucial tasks during the meeting at the county offices before beginning the development of the district. The first order of business was to name the positions for the board. Bob Pitakos was voted as the chairman of the board unanimously. Pitakos moved to Fayette County in 1980 and was hired by the State of Ohio’s Department of Natural Resources, where he remained for 31 years. He left after his tenure in the position of assistant parks manager and was also in charge of regional law enforcement for Region Six, which consists of Madison Lake, Deer Creek State Park and Buckeye Lake. After leaving in 2010, Pitakos became an auxiliary deputy with the Fayette County Sheriff’s Office and even served as dog warden for a few years. Angie Tackett was voted as the vice chairman unanimously by the board. Tackett, who works for Heartland Hospice, has ties in many other community organizations. Besides her work in various support groups, she is knowledgeable of and well known by businesses inside as well as outside the county, and also works in marketing, education and said she does a little of everything. She also said she is planning on contacting other park districts in other counties. Also approved unanimously during the meeting was Dave Kiger, the final board member, who was voted as the treasurer to the board. Kiger has been practicing law in Fayette County for 25 years and said he is just a humble member of the community. He was asked by some “very philanthropic members of the community” to serve and thought the district was a great idea for the county. Opting to not hire a private entity, the board will rely on Kiger to keep an accurate report of incoming funds and outgoing expenses. Additionally, Fayette County Auditor Mike Smith and his team were taken up on their offer to handle various responsibilities as the new board becomes established to make accounts available for expenses and incoming monies. Kiger will work with Smith and his team, as will the other members of the board, to help give the district a strong foundation moving forward . The board also approved a regular meeting day of the first Wednesday of the month at noon at the county building, either on floor two or four. The board also said it could potentially open up other meeting dates in the evening as well as hold more meetings as they continue to build the district. Tackett also spoke about the “Fayette County Park District” Facebook page that she created recently. They are encouraging residents to visit the page and provide input to the board. Finally, a few village leaders from Jeffersonville, and Sarah and Don Creamer (with various groups), offered their services to help with the district, and Dave Stanton, who served as the golf course superintendent at the Club at Quail Run, urged the board to purchase the golf course as soon as possible to keep that resource available. The next meeting of the Fayette County Park District will be Feb. 1 at noon at 133 S. Main St. in Washington C.H. https://www.recordherald.com/wp-content/uploads/sites/27/2017/01/web1_ParksandRecBoardPicture.jpgThe Fayette County Park District met for its first official meeting on Wednesday and named Bob Pitakos (seated) as chairman, Angie Tackett (left) as vice-chairman and Dave Kiger as treasurer for the board. With more planning to do, the district board is urging the community to visit their Facebook page “Fayette County Park District” to help make recommendations and to bear with them as the process won’t happen overnight.